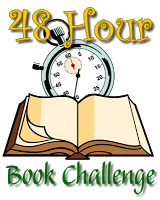 It is time for the Ninth Annual 48 Hour Book Challenge. This is my official starting line. I am attempting to read and review as many diverse books as possible in the next 48 hours. There are some complications; I'm going out of town since I was acutely ill Memorial Day weekend and didn't see my family. Hopefully I can read in the car while my dad drives. I'm going to start by listening to FAT ANGIE by e.E. Carlton-Trujillo while I do chores. Then, I'm going to start reading COLD CALLS by Charles Benoit. I hope the reading works out for you (and that you are feeling all better!) Looking forward to hearing what you think of Fat Angie. I am much better! (It has been two weeks.) I just needed antibiotics. I hope your reading works out for you too! Great minds! I read Cold Calls. A bit more YA, but interesting and apparently ACTUALLY one that should be in the diverse pile (I question every after nine hours of reading!) Hope you are feeling better and have a nice visit AND get some books read. Well, Fatima is Muslim, which makes it diverse to me. I liked COLD CALLS, although I wished that the characters were more fleshed out. Your choices sound really good. I hope you were able to read in the car and have a good weekend. I was able to read in the car! . . . but not many other places.